NASA’s Voyager 1 soars through interstellar space 40 years after it was launched, as depicted in the new film, "The Farthest." Forty years ago, NASA launched twin robotic explorers on a mission to travel farther out than any spacecraft had gone before, and today, they continue to be our most distant emissaries. The story of those probes, and of the people behind them, is the focus of the aptly-titled documentary, "The Farthest," airing Wednesday (Aug. 23) on PBS. The Voyager probes, referred to by numerical designators "1" and "2," revealed the outer planets of our solar system and then continued to sail beyond. Voyager 2, which was the first to launch on Aug. 20, 1977, visited Jupiter, Saturn, Uranus and Neptune. Voyager 1 departed Earth on Sep. 5, 1977, overtook its counterpart, and was the first to arrive at Jupiter and Saturn. "There are two parts to Voyager," said John Casani, who in 1977 was the project manager for Voyager at NASA's Jet Propulsion Laboratory in Pasadena, Calif. "There's the part of getting the thing designed, tested and put together so it is working right, getting it to the launch pad and getting it launched. The really interesting part happens after that." "That is where the clock that is counting down to 40 years starts, at liftoff," said Casani, in an interview preceding an early screening of "The Farthest" at Space Center Houston in Texas on Aug. 1. "Voyager really is an amazing mission. Not only because it lasted so long, but it really, for the first time, gave anybody a picture of what the solar system out beyond Mars was like. We had no idea," he said. Casani is featured in "The Farthest," along with more than 20 other engineers, scientists and citizens who contributed to the Voyager mission 40 years ago. "Space films can be challenging because they can be very impersonal. This one sort of goes to the other extreme," described Jared Lipworth, consulting producer with HHMI Tangled Bank Studios, which collaborated with the Ireland-based production company Crossing The Line to present the film. 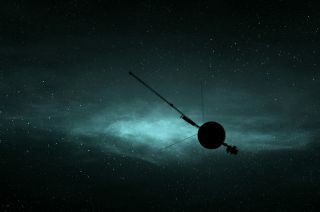 NASA’s Voyager probe sails by Saturn, as seen in the new film, "The Farthest." "There are just so many of the people who were involved who have stories to tell," he said. "So, it really became as much about the people as it did about the mission." That includes Casani and Frank Locatell, an engineer who led the design and development of the Voyager propulsion module and, for the year prior to launch, was responsible for the flight readiness of all the mechanical hardware on both probes. "I think Voyager represents an evolutionary step in human development. I don't think that's a stretch [to say]," Locatell told collectSPACE. "Voyager is a story about science, and about the application of science and what that application could mean on our development as human beings." "When Voyager was launched, I don't think we had any idea about some of the really strange worlds we detected out there," said Don Gurnett, the principal scientist for the plasma wave instrument that provided the evidence that Voyager 1 had left the solar system in 2012. "I remember after going by Jupiter and Saturn, being invited to science fiction conferences to talk about the worlds we discovered out there." "It wasn't just the planets — Jupiter, Saturn, Uranus and Neptune — but a whole collection of moons. I lost count, but there are some 30 or so moons," Gurnett said. In addition to revealing the details of Jupiter's and Saturn's known satellites, Voyager 1 and 2 found three new moons at Jupiter and four at Saturn. Voyager 2 found 11 unknown moons at Uranus and six at Neptune. Voyager 1 discovered active volcanoes on Jupiter's moon Io, an ocean on Jupiter's moon Europa and a nitrogen-rich atmosphere on Saturn's moon Titan. "The Farthest" also tells the history of the Golden Record, which on each probe carries music, images and greetings from Earth should intelligent aliens someday discover the one or both of them. NASA’s Voyager 2 spacecraft is encapsulated for launch in 1977 at the Kennedy Space Center in Florida. "The scientists at the time, a lot of them, did not want to have anything to do with it," Lipworth said. "They did not want it on [the spacecraft] and didn't like it was getting all the attention. But that says a lot about humanity. It was as much for us as it was for any alien that might find it." Conveying the Golden Record may be the Voyagers' last mission, but the two probes' legacy is closer to home, said Casani. "It is like saying 'What do we think about Columbus?' He discovered the Americas, or something like that," Casani explained. "The Nina, the Pinta and the Santa Maria might as well be Voyager 1 and 2. They showed us what was in the outer solar system. That will be their lasting legacy." "Voyager was not about learning how to build machines. It was about learning what was out there. Voyager told us what was out there." Take an inside look at "The Farthest" about NASA's Voyagers probes at collectSPACE.